E-bikers take note: The stand holds bikes up to 80 pounds. Park Tool redesigned its popular workstand with teardrop tubes and beefed up legs, aiming to deliver a bombproof option for the home mechanic. 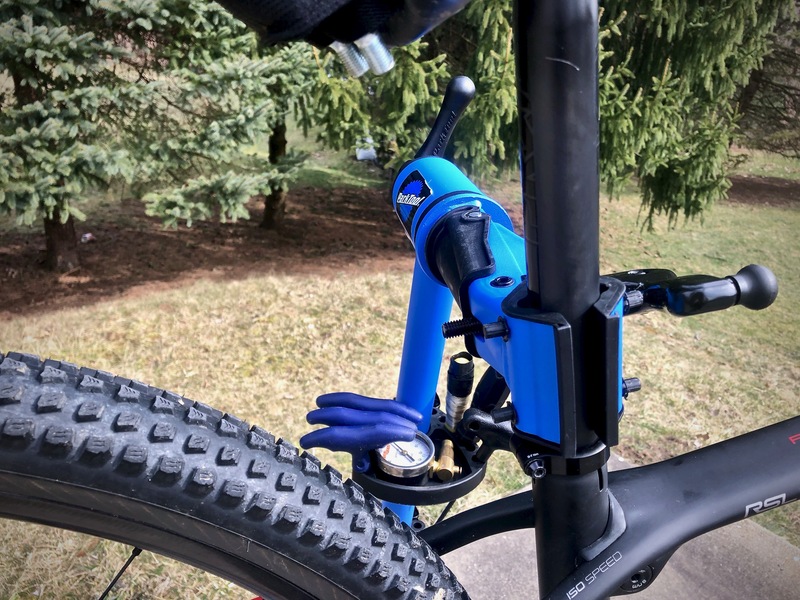 The simple three legged system accompanied by a stout adjustable upright column creates a solid platform capable of handling bikes up to 80 lbs. The Park Tool PCS 10.2 Deluxe Home Mechanic Workstand is easy to set up and also folds up for easy transportation or storage. 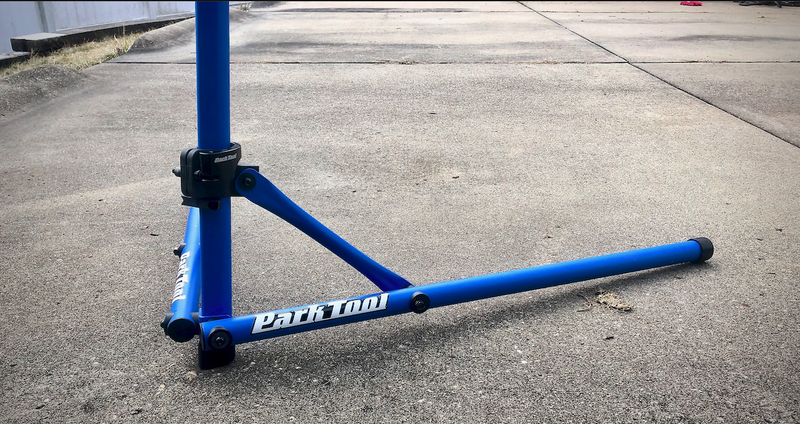 Park Tool products have been a staple of home and professional bike mechanics since 1963, manufacturing all manner of tools and stands. The Park Tool PCS-9 and PCS-10 workstands were launched in 2006. Now Park Tool has redesigned these stands to accommodate the changing market and the need for added weight tolerance and unique tube shapes. The latest iteration is the Park Tool PCS 10.2 Deluxe Home Mechanic Workstand. The attached tray makes it easy to always have the right tool at hand. The new stand comes with all the necessary tools for assembly and is ready to hold your favorite steed in minutes. The Park Tool PCS 10.2 Deluxe Home Mechanic Workstand boasts a larger footprint than the original. The unique fold-out design places both legs entirely on the ground while the stand unfolds from the top down. The unique three-point leg system and stout adjustable uprights create an excellent platform capable of handling bikes up to 80 pounds. This new design allows for enhanced stability. The aero-shaped tubes look cool but also serve a purpose, creating a solid bracing point for the stand and allowing for zero sway. 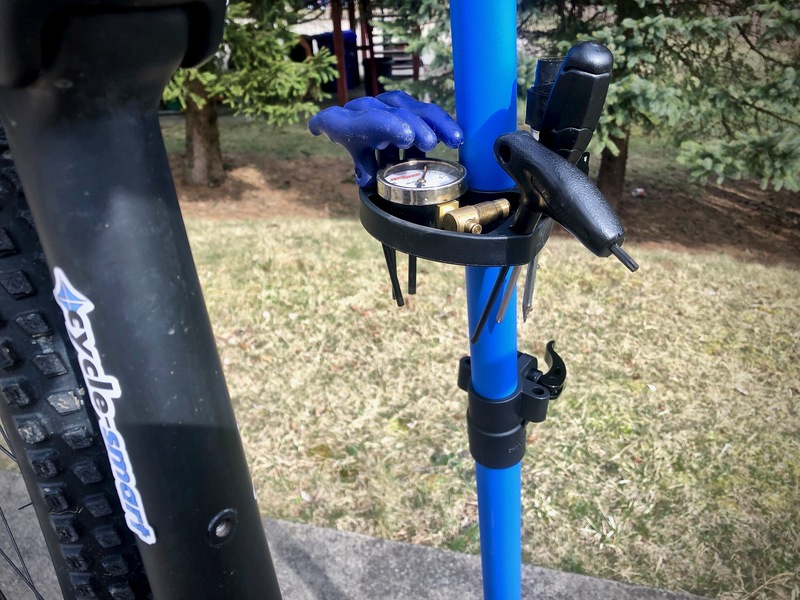 And while I missed the option of moving the bike manually with the PCS-10, I appreciate the rock-solid feel of the Park Tool PCS 10.2 Deluxe Home Mechanic Workstand. The clamp’s soft rubber padding is carbon friendly. 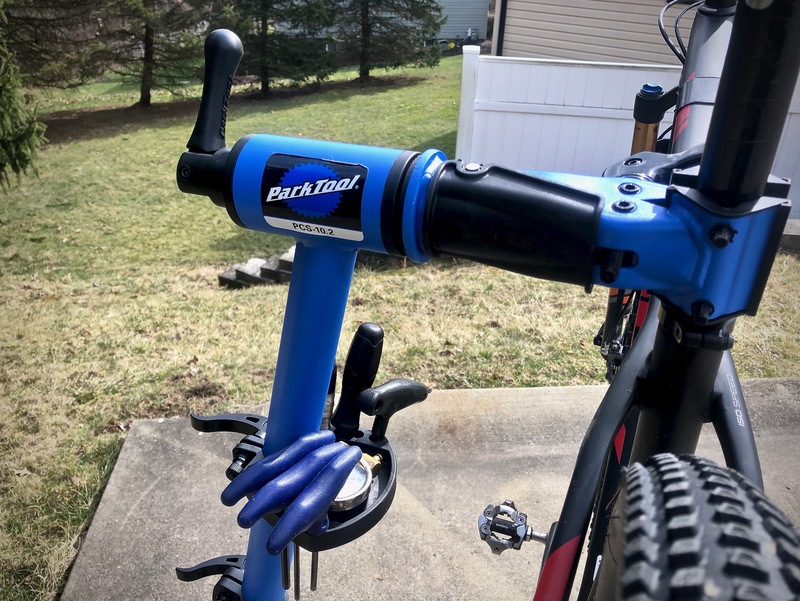 The Park Tool PCS 10.2 Deluxe Home Mechanic Workstand uses the same micro adjustable clamp that most bike shops have, including the rubber “quick adjust” cover and clamp for easy entry and exit. Indeed, the PCS 10.2 is covered in quick releases for ease of motion and security. The quick release for the tray and stand height are impressive, as is the large clamp for the legs. 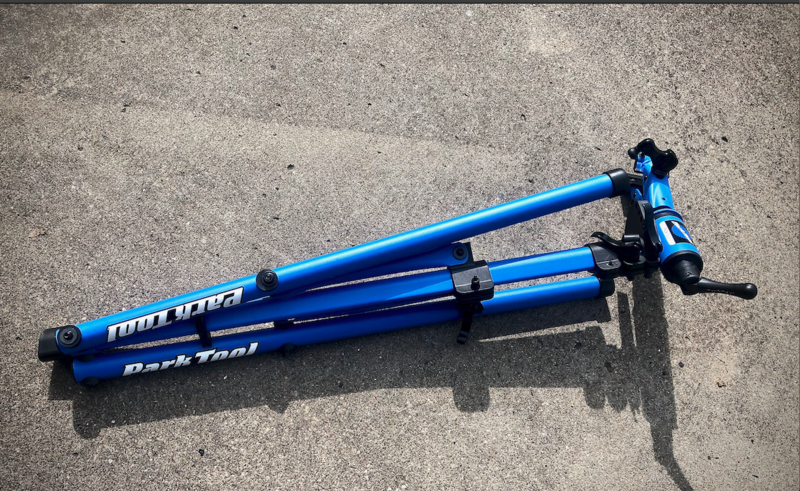 All tubes of Park Tool PCS 10.2 Deluxe Home Mechanic Workstand contain glass filled nylon composite fittings and top tube internals to create smooth rotation and secure positioning. And though I cannot speak to the exact science of it, this stand delivers effortless adjustment, the aero-shaped tubes keeping linear movement smooth. The stand boasts a larger footprint than the original. Also noteworthy are the tool tray and small parts holder. It’s particularly handy for brake bleeding, or any procedure that requires multiple tools. The parts tray is slotted and works well with all manner of wrenches. And the tray itself is adjustable and easy to move out of the way when not needed. The Park Tool PCS 10.2 Deluxe Home Mechanic Workstand fit 1” to 3” diameter tubes and seat posts of any shape. The soft rubber is carbon friendly. And for those that like to have the drivetrain at eye level, the stand’s quick release height adjustment ranges from 39” to 57”. When the job is done, the Park Tool PCS 10.2 Deluxe Home Mechanic Workstand collapses quickly, though the way the legs fold up leaves me wanting a sturdier option for storage. I also wish this stand came with a storage bag like some of the other Park Tool stand, though you can by one after the fact. 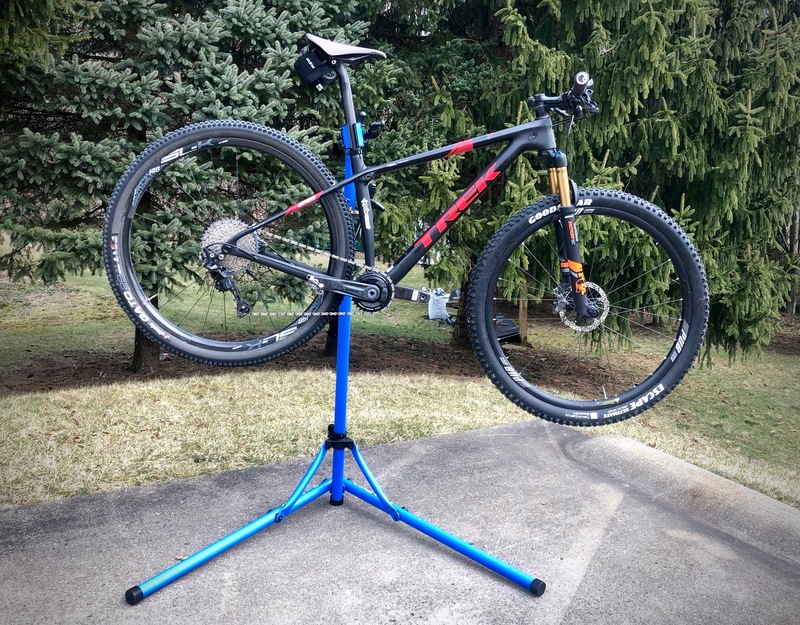 Bottom line, if you like to work on your own bikes the Park Tool PCS 10.2 Deluxe Home Mechanic Workstand is worth a long look. Price is reasonable. Build quality is top notch. And it simply works well, allowing you to get your bike in the right position for the task at hand. The tubes of the Park Tool PCS 10.2 Deluxe Home Mechanic Workstand deliver smooth rotation and secure positioning.